Many teens express concerns about their appearance and sometimes those who work out and watch their diets do so strictly for aesthetic reasons. Rarely do they cite the health of their cardiovascular and respiratory systems as the reasons that they exercise, but teens are on the brink of adulthood and should begin to consider their long term health. Aerobic means "with oxygen," and aerobic fitness refers to the use of oxygen by muscles. In order for a workout to be aerobic, activity must be sustained for an extended period of time, usually at a moderate level, although high intensity workouts can certainly be aerobic as long as they incorporate the types of activity that gets the blood pumping and increases respiration. Weight training and running sprints are not aerobic, but swimming, cycling, or running distances are. The benefits of aerobic exercise cannot be understated; truly healthy bodies not only look good, but function at their best, as well. Strengthen their lungs, making them better able to transport oxygen throughout the body. Strengthen their hearts, making it more efficient (and longer lasting!). Improve circulation and help to maintain healthy blood pressure. Increase muscle endurance, enabling them to sustain activity without fatigue. Stabilise blood sugar levels, decreasing the incidence of diabetes. Reduce their risk of developing some forms of cancer. Relieve anxiety and depression and help them to manage stress. Improve self-esteem and help to develop healthy body images. How Much Aerobic Exercise is Best? Many experts recommend exercising at either a moderate to intense level for 30 minute sessions, five days a week or exercising at a vigorous level in at least 20 minute sessions, three times a week. Teens should be active for at least an hour daily, but not all activity need be aerobic in nature. It's also important for teens to understand that all activity counts, not just when it is done all at once. Teenagers today often lead very busy lives, with obligations to school, friends, family, and part-time jobs. Ten minute walks and bike rides count toward total activity, but it is important that they do carve out blocks of time for aerobic workouts, as well. 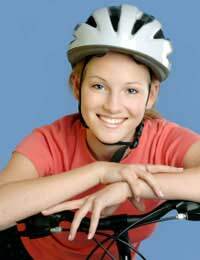 Walking, cycling, cross country skiing, and swimming are all good choices for teens. If you can sing while working out, you need to step up the intensity. If you can maintain a conversation, you are probably doing about right. If you can't talk while working out, the level is too intense. Knowing their family health history can sometimes help to motivate teenagers to pay attention to their fitness levels and exercise to improve their health. Genetic factors can play roles in many illnesses including diabetes, hypertension (high blood pressure), and heart disease, but being diligent about diet and fitness can help teens to stay healthy. While their immediate concerns may be about their jeans, a little information about their genes may provide them with a more long term outlook.